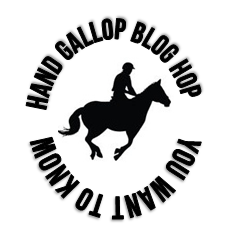 Hand Gallop Blog Hop: What’s in a name? So in an attempt to continue blogging, I’m going to try my first blog hop! Thanks Hand Gallop! What’s the origin of your horse’s show name and barn name? Sub’s show name is Subliminal which was his name on the track. His sire is Power of Mind and his dam is TV Bee (http://www.pedigreequery.com/subliminal). When he came to my then barn from the track, they kept the name Subliminal and called him Subi for short. Subi is sort of his barn name, but Subliminal has always been used as well, especially for all official (or unofficial) paperwork (aka – vet bills and boarding contracts). Nicknames are Sub, Subba, Dub, Dork, Submarine, Subbers, Subba Dub Dub. He’s also been referred to the drama queen and diva by horse professionals. Batts was once Batman. He was named by my former trainers kids. He joined a group of lesson horses that included a Scooby, Barney, Bam Bam, Hot Wheels, Sponge Bob, etc. He’s a chestnut. I struggled with his name but couldn’t bring myself to really change it. So, his show name or “official paperwork purposes” name is Batiste and he goes by Batt or Batts. Nicknames also include Batthorse, Batty, and Battabat. Aw, what good names for your ponies! I’m the same way with struggling to change names- it just feels weird to rename them, especially if they’re older and have been called something for a long time! Exactly! Even worse when you’ve known them by that name! Both Subi and Batts have been Subi and Batman for as long as I’ve known them. I love Subi’s name, but Batman? Not so much. But Batt I can deal with so there you go. And now Hayley is Hayley so even though I don’t love the name, it’s her name.